Russell Wilson will get his record contract, as a Seahawk or elsewhere. The trick is for Pete Carroll to persuade him he can be the greatest winner ever in Seattle. As we all know, Russell Wilson says something original about as often as the Mariners succeed with a high draft pick. But late in the season, the Seahawks quarterback did offer up something I hadn’t recalled hearing from him, which may bode well for his future in Seattle (and perhaps might be a rare good omen for the Mariners). “I just want to be known as the greatest winner ever,” he said. Hardly a shocking thing to hear from a high-achieving athlete, but a rare moment of public ego on Wilson’s part. If he is being truthful, the goal underscores what will be required from his current and potential future employers to retain his services long-term. It also may explain a little about some recent team developments. I claim no knowledge about what makes a good football-team strength/conditioning coach, nor why Chris Carlisle and three assistants were recently fired from their jobs by coach Pete Carroll, who brought Carlisle with him from USC to Seattle in 2010. But if you told me that the heir apparent to the strength-coach job, Ivan Lewis, the current USC coach who has worked with Wilson in Los Angeles during previous off-seasons, was about to succeed Carlisle, then I would suggest you might be on to something. Not saying that Wilson’s desires were the main reason for the change. Hey, maybe Carlisle wants to join the federal government so he can work for free. But if I were a football boss who knew that in this off-season, I was planning to make a monumental offer to extend the contract of Wilson for several years, I’d be doing as many non-cash improvements to please Wilson as possible, while others are assigned the task of stacking the bricks of gold bullion. Since the final year of Wilson’s contract is 2019, the custom in the NFL is to strike a deal for an extension in the prior off-season. The league-wide expectation is that the extension for Wilson, 31 next year and coming off arguably his most efficient season despite a run-game emphasis, will set a jaw-dropping standard. An extension with an average annual value north of $35 million (he made $21.3 million the past season) will be sought by his agent, Mark Rodgers. The Seahawks also have the option of the franchise tag, a one-year extension estimated to be about $30 million for 2020. A second use of the franchise tag in 2021 would be around $37 million. For a full exploration of financial possibilities, see Friday’s CBSSports.com story by former agent Joel Corry. But if we take seriously, for argument’s sake, Wilson’s remark about wanting to be the biggest winner, it suggests that non-cash items will be a factor. The question becomes: Is he more likely to achieve that goal somewhere besides Seattle? While that answer’s permutations are many, what is known is that Wilson has won more regular-season games (75) through a career’s first seven seasons than any QB in NFL history. His career QB rating of 100.3 is second to Aaron Rodgers. And in a not-insignificant single-season achievement this year, he was the only QB in the NFL to play every snap — despite enduring a career-high 51 sacks. But as his agent would point out, that was then. What about the future? The Seahawks have already done the most significant non-cash thing they could do. After the death of owner Paul Allen, who hired Carroll, the club, now owned by Allen’s sister, Jody, and Carroll agreed fairly speedily to thwart uncertainty by extending his contract through 2021. The efficient work connection between Carroll and Wilson may be second in the NFL only to Bill Belichick and Tom Brady, only with less dramatic tension. Carroll demonstrated his knowledge of how rare a QB of Wilson’s caliber is to ultimate success. When Carroll realized that offensive coordinator Darrell Bevell was no longer pushing Wilson to be the best, he was fired. When Carroll realized that CB Richard Sherman, who believed that Wilson wasn’t as accountable for his mistakes as the rest of the team, had become a threat to divide the locker room, he was fired. Obviously, Wilson would never say a bad word about anyone, even Darth Vader (“He’s experienced, he’s tough and he loves the process”). But Wilson often makes mention of Carroll’s most significant attribute, heard for years from others around the locker room and elusive for so many franchises. In a volatile sport rich in thin victory margins, bad bounces and only 16 chances a year to do right, the relationship Wilson has with Carroll may be unique, and uniquely valuable in sustaining success. At his seasonal sign-off presser Jan. 7, Carroll signaled the full-court press had begun. In a marketplace where some team will pay Wilson top dollar, no matter how preposterous, his agent will see to it that no home-team discount will be given. It will be up to Carroll to convince Wilson that the thing money can’t buy — recognition as the greatest winner ever — can best be done where he’s always been. It had not occurred to me that RW might choose to go elsewhere. The way Russ speaks, he sounds like an extension of PC. I think he knows a good thing when he sees it. I think he knows that part of why he’s had the success he’s had is because Carroll took him under his wing. All last off-season, I saw it the other way around, actually. I was floating the idea that JS/PC thought maybe they’d seen enough of RW to know he was too limited. I wondered aloud if they would look to trade him for one of the top QBs in the draft. Instead, they gave him Schotty and challenged him to get better and evolve. I’m pretty sure he impressed them. He impressed me, and I really loved the deep balls off the running game. They did on offense exactly what I think will work next year. They just need one more player. I can’t tell if its a WR or OL, or for Penny to step up, or maybe its Dissly… But they need one more guy. I think the D’s needs top anything on offense. Remember that next season the should have the healthy returns of TE Will Dissly and OLs Jordan Simmons and Jamarco Jones. A tall WR is the missing piece on offense. Art— Still glowing after the big win against Geneva? Russell on Darth Vader? Too cool! I’m still chuckling. 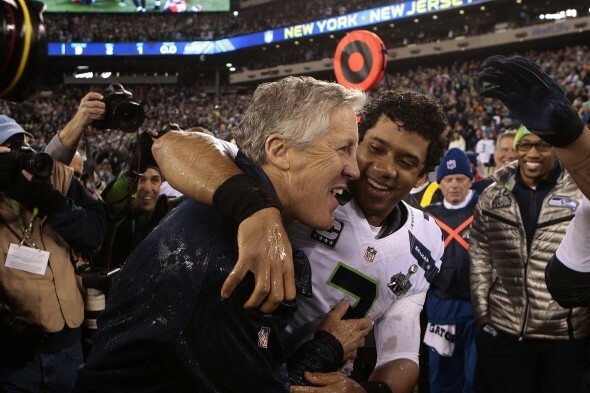 Carroll obviously saw how special Russell Wilson was back in the beginning. Since when does a team allow a three way competition for starting QB, when you have a known veteran and a high priced free agent signee already on the roster? Carroll had a belief in his 3rd rounder, gave Russell a fair chance and in turn he proved Pete right. The fitness staff change is intriguing, especially from the science of fitness perspective – what was soooo different in philosophy, perhaps? I’m sure that no one in the Seahawks organization would let on, but I believe that Russell Wilson being a lifer with the Seahawks is 80% of the way complete. While being the best team player, and as selfless as he is, he is as important to the franchise as Pete Carroll – he is an extension of Pete on the field, in the locker room and in the off season. Russell is Obi-wan Kanobe to Pete’s Yoda. Go Hawks! Thanks for continuing the Star Wars theme. Not sure whether ground has been plowed on a new contract. The agent really wants Wilson to get to free agency. His history in baseball bears that out. But so far the Seahawks have made nearly every effort to make Wilson want to stay. Felt compelled to comment even before I read DJ’s comment. Your conjecture (I assume) about Wilson commenting on DV is that rare event that results in me laughing out loud. So much summed up in so few words. Wilson belongs in the same club as my childhood (lifelong) hero Ernie Banks and Lou Gehrig, both lifelong members of their respective teams. Spot on Art. Right on DJ. Go Hawks! Thanks. The “lifer” in pro sports is increasingly rare. But fans of long duration value that virtue the most. (Wonk alert) Let’s say Russell Wilson agrees to $130M guaranteed over 4 years (no one cares about the non-guaranteed parts). And, let’s say the cap goes up by $60M next year. Even if they rip up the final year of the current deal, that’s only a $12M raise (we should all get such paltry raises, but I digress). Frank Clark is going to cost $17M, even with a franchise tag, unless management can figure out a way to lessen the burden in year one via a bonus. Jarron Reed is up for a significant bump, as are a few others. Where do you think that leaves K.J. Wright…in? Out? Trade fodder for picks? And will they sign an impactful FA lineman (on either side of the line)? Is David Moore really a dependable 3rd receiver, or do they have to buy one? $60M goes pretty quickly, doesn’t it? If you read the linked Joel Corry story, you can see how complex the cap impacts are. A player’s market value against a team’s cap is a fluid thing that changes almost weekly, and more than I can explain here. Briefly, Wright is likely to go FA, and may not get offers, given age and recent injury history. He could re-sign with the Seahawks for less money than than he had this season. As I wrote earlier, a rush end I believe is the priority if they keep the first-rounder. But if they trade down for additional picks, it’s wide open. II think they like Moore as a depth receiver, but they still lack the the tall WR they hoped Brandon Marshall could have been. Thanks, Hairy, for inspiring a warm memory. Beyond the football dynamics, Wilson has cultivated a relationship with the community that may play into his decision. He is bright, personable and astute. It would not be a surprise if he harbors political ambitions. If so, that argues for staying put rather than starting over someplace else. Well, if he does have such ambitions, that suggests the second half of his career should be in LA or NY, yes? Or D.C. Didn’t Alex Smith just break his leg? “Mr. Smith Goes to Washington”? Maybe Mr. Wilson too. I’m guessing Ciara votes LA. Philip Rivers has to retire someday. Or they could cut him at age 39. No. Wilson could never be as much of a hero in NY or LA as he became in Sealeading the Hawks to a first Super Bowl win. Better to build on what he has here than start over someplace else. Of course it’s all wild and trivial speculation but, hey, that’s what sports blogs are for. Moderation in all things. Except HOF QB’s. So you are an extremist. Not a $35 million a year extremist. Brady and Peyton took less to help their team’s situation. Possible. He could have done that for his previous extension and didn’t. But the Seahawks settled for four years instead of the five the club sought. His agent wants to break the NFL bank. Typical great insight and humor from Art Thiel! Thanks. The Carroll-Wilson connection is classic synergy. I don’t see either being as successful without the other. I think they both see that, as does Schneider. And it’s truly special for us 12s. I BELIEVE they’re going to get it all worked out. I sense sentiment creeping into your response. This is all bidness, no matter what is said publicly.